It's been awhile since I've run a Turkey Trot, but I'm a sucker for family events, so when my sister floated the idea of running the ALSO Youth 5k on Thanksgiving morning, I had to say yes. The race fit in nicely with my training plan, too; I planned to go easy so my legs would still be fresh for my long run on Saturday. Gordon drove Steph, Matt, and me to the race start around 6:15 in the morning. He wasn't running, but kindly volunteered to watch our stuff and get photos for us. Race morning, I opted to wear the Wonder Wool shortsleeved top rather than the Watch Me Go because it was a little warmer than anticipated. We picked up our packets and wasted 40 minutes waiting for the start by using the bathroom multiple times. This race benefits a great cause; all proceeds go to ALSO Youth, which is an organization for LGBTQIA kids ages 13-21 who are in need of a community and support. It was really nice to see 1500 participants supporting the cause in this red county in Florida. Steph borrowed my Redemption Shorties so she'd have a pocket for her phone. 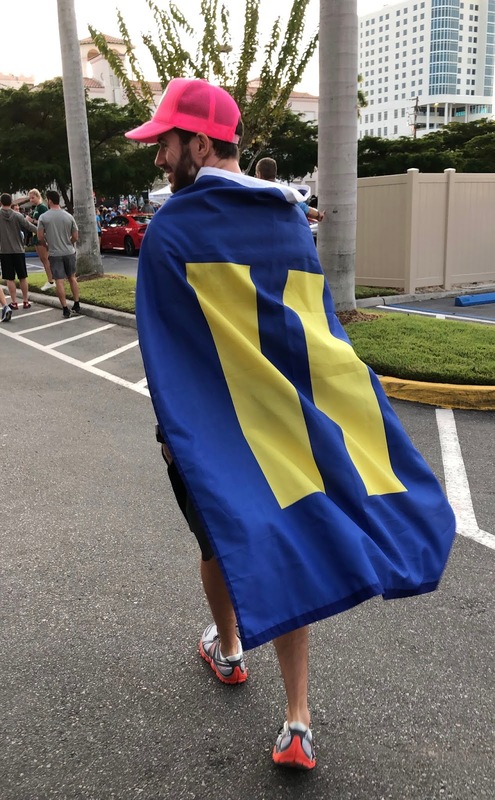 Matt opted to wear his HRC equality flag, since he was just running for fun and didn't foresee himself placing. Moseying along to the start line. For the first mile or so, Steph and I stayed together. We had to dodge in and out of a lot of walkers the entire race. That's another downside of...well, of turkey trots in general: they tend to attract race newbies and tons of young kids. In other words, there's a major lack of race etiquette on the course. I had planned to walk the ascents of the bridge, but felt pretty good on the first one. After cresting the top, Steph overtook me and we ran the rest of the race alone. I took my one and only walk break on the second ascent. I was just tired. Plus, the wind was now against me and my music station was boring me to death. I changed music and was running again after one minute of walking. It was all I needed to power up the rest of the bridge and through the end of the race. With half a mile to go, I began to regret my effort. 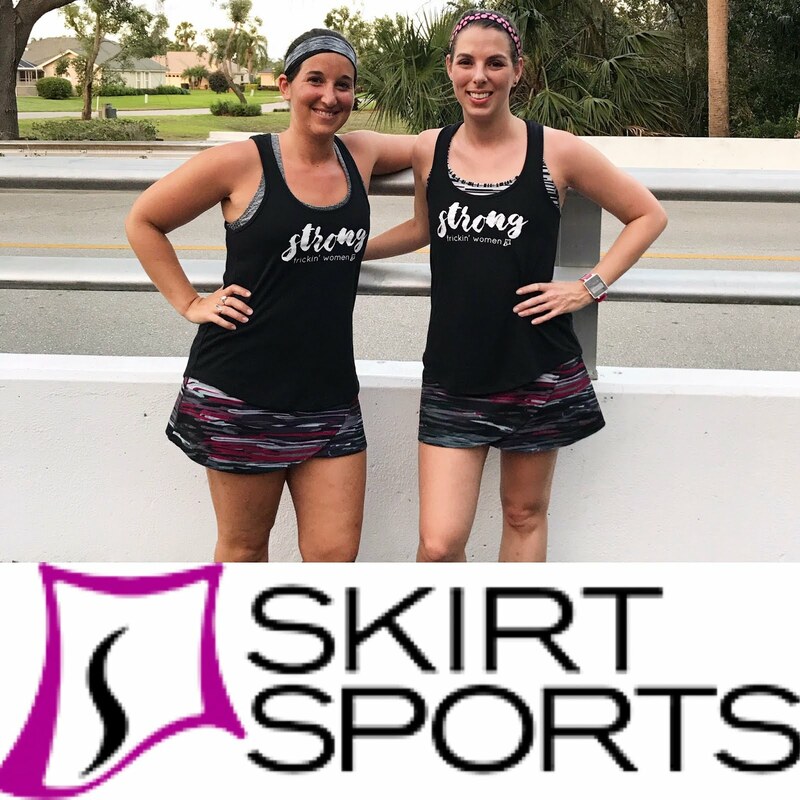 I knew the dodging-and-weaving from early in the race was going to add mileage, and I knew I had a long run on Saturday. I realized I should have set a more conservative goal, something like 33 minutes, and just taken it easy. But now I was in it and I just couldn't let up this close to the end. I kept on pushing right through the finish line. The others found me and we rested a bit and then found our finishing times. 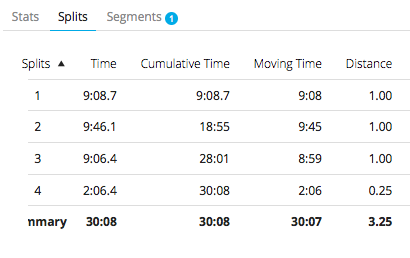 I wasn't sure what to make of mine; considering the total distance according to my watch, the chip pace/time seemed off, but since I wasn't really hoping for a strong performance, I didn't mind much. None of us placed, so we decided to head home. Steph's and my finishing times according to the chip. My Garmin data. The distance tracked long, so I think my actual 5k was probably sub-30; that being said, I should have run this much easier than I did. 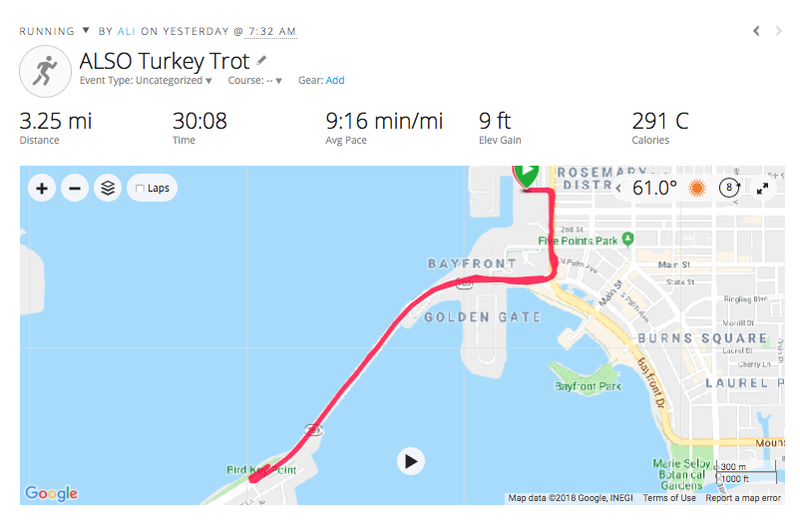 I'm glad we ran the turkey trot, but I do hope the organizers fix the congestion issue next year. Even just having walkers start five or ten minutes ahead of racers would be helpful! That said, it's been 9 years on this same course, so I doubt a solution is forthcoming. The course is definitely a tough one, so it's not always easy to fit into my schedule, but I do hope to be back in future years to do this one again so I can continue supporting the cause. *Edit: My legs held up fine and felt good on Saturday. A little tired, but not painful; I kept my pace a little easier than it has been on previous long runs and was fine!